On my visit to MOMING07 I also purchased from Mr Bennett his 'Loco underframe kit for 24.5mm Tenshodo', although I didn't really know what I was going to do with it. 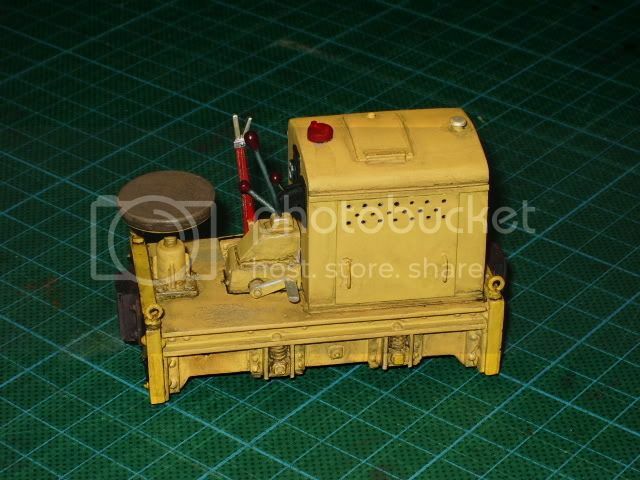 Then I found a photo of a Deutz OME-117 and decided to build something that looked a bit like that – I liked the holes in the sides of the engine compartment. I assembled the Wasp underframe as intended by the designer, but altered the profile of the side-frames. Then I made the engine compartment to suit the available space – if only I had had a vertical drill stand to do all those holes! I lashed up a gear-box and seat, and used the buffer beams from the Gnat underframe kit. I intended from the start to paint it yellow (honest! ), but it took 3 attempts to get it right – at least using car undercoat enabled me to scrub the paint off with white spirit. This time I decided to keep the weathering light, and just did a wash with well-diluted burnt sienna acrylic. A shot of the loco with female driver, sitting side-saddle – is she big or is the loco small? I like this one as it isn't derivative – all my own work (apart from Mr Bennett's underframe…and buffer beams…and brake lever…and throttle box….and couplers…..
Again really nice - weathering is perfect just enough to bring out the detail. Great little loco and weathering. I think the figure size is OK it just the pose. I think the arms are too wide. Sit like that, it's arkward and unnatural. I suggest trying to reposition the arms with the elbows brought into the body. Good to see you post them here Bill, you are too critical of yourself, they both look great, but then, you did have a goof base to start from . Looks like you are getting the hang of the new airbrush aswell. Glad to see you kept the weathering light on this one, it looks great. The "Gnat" is good but this........................Flip! Floats my boat! 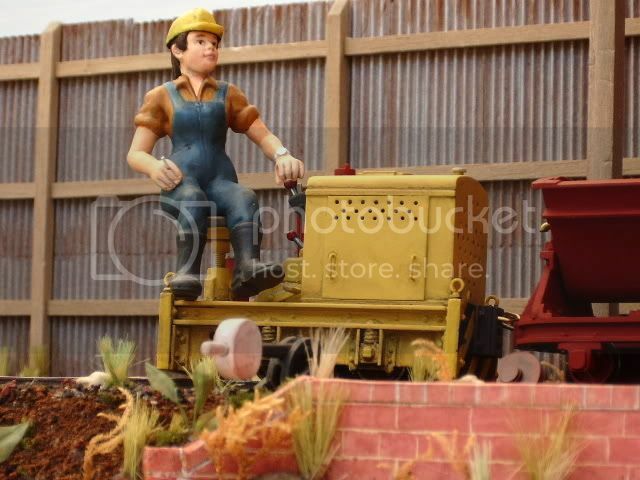 DCRfan wrote: Great little loco and weathering. I think the figure size is OK it just the pose. I think the arms are too wide. Sit like that, it's awkward and unnatural. I suggest trying to reposition the arms with the elbows brought into the body. Didi on the Deutz-ish loco, sticking out her elbows. A view of the underpinnings, showing the additions to Mr Bennett's Wasp sideframes and the footplate - it would have been nicer with a bit of checkerplate. 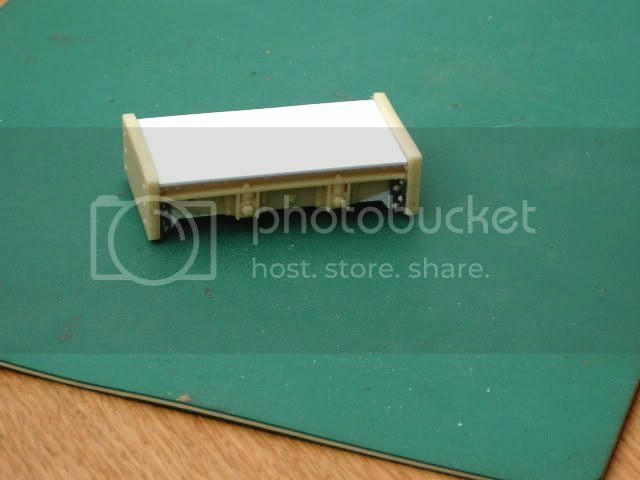 You mention chequerplate, take a look at the plastic banding used to tie up large packaging, you'll find that although it's only 12mm wide it's more than suitable on these small locos. If you look at my VB loco you'll see a small area used beneath the firebox door. Gerry that is exactly what I used on my second loco the rusty hulk. Many thanks for that tip Michael - it looks really good in your photo. I`m glad you posted that tip Gerry and Michael, had to buy new bathroom faucet last evening, the package was banded with that stuff, my wife went to throw it out, oh no don`t do that says I, blank stare from my better half poor long suffering woman, then says oh I suppose you are going to use this for a model train, yup, and again from her. 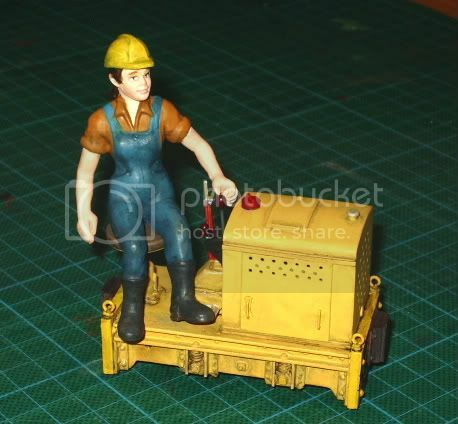 I see in the latest Narrow Gauge & Industrial that KBscale have brought out a kit for the Deutz OMZ 117. 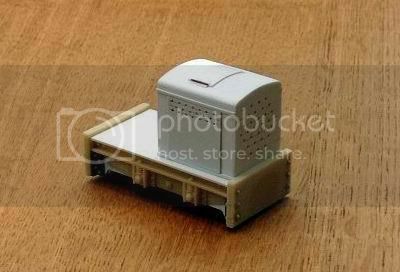 It can be built to 16.5mm gauge, too, so it's eminently bashable - if you don't mind the price-tag. I could have saved myself all that anguish over drilling the holes! I agree it's a superb Loco Bill BUT I'd be more than surprised to see one bashed. The fact that it's a etched brass body immediately reduces the number of buyers as does the starting price of £100. An alternative would be to find out if the chassis could be purchased separately, then there's no bash at all - maybe I'll ask at Shepton. We are all looking for a good motor on four wheels to put under our own hen houses. Yes Gerry, I don't think many people will fork out £100 for something to muck around with, although, as you say, the chassis could be of use if available separately. I was thinking more of using the etched parts for the engine compartment to obtain what took me hours to do. 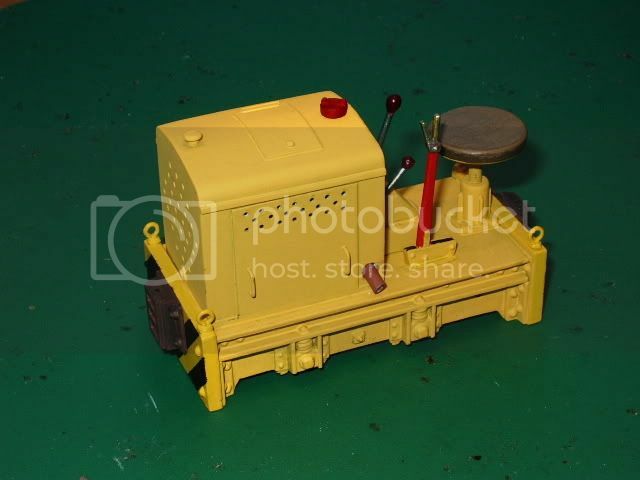 However, even with all the rejected attempts at getting a straight line of holes, the total cost of my Deutz-ish loco was a tenth that of the kit! I've been taking some photos of the v-skips to send to Helmut, to show him what atrocities I've committed to his beautifully designed skip frames. I posed them with "Wot the Deuz" on my 16mm (sorry ) layout and snapped away with the old digital camera - what did we do in the days of wet film? Anyway, one of the shots of the loco was quite pleasing, and it shows the small changes I've made to Didi's pose. The left hand has been rotated to rest on the gear lever knob, and gained a wrist watch to hide the rough hand/arm join, and the right hand and arm have been moved closer to the body, with the hand resting on the right thigh. Didi has also taken up smoking, actually a brass pin holding the hand in place after repeated cutting and gluing to get the required pose. The v-skips have been undercoated red oxide, and I'm trying to summon up the courage to weather them! Nice photo Bill, would never guess it was on the wrong gauge very effective. Is Didi another Scleich (sp) figure? The alterations do look good, she fits the loco much better now, nice work Bill. it's a very beautiful critters ! 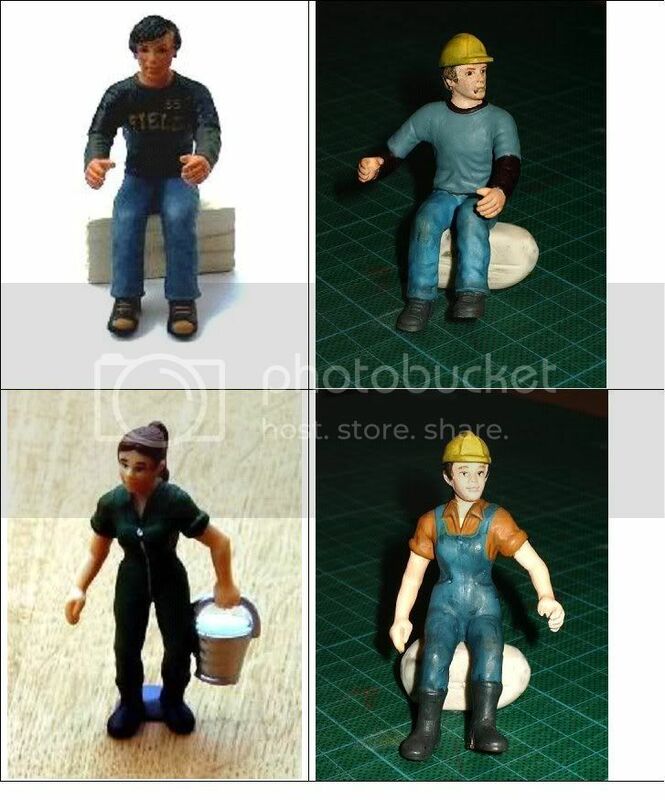 The figure on the left is an old one, and I've seen him unmodified on several layouts. The central figure is (I guess) a blacksmith, and a mighty man is he - 90mm tall, or over 7' in half inch scale, 7' 6" in 12mm/ft, and just under 7' in 13mm/ft. At 16mm/ft he is a very respectable 5' 6". Mind you, the man carrying the axe is about 85mm tall - 6'6" in 13mm. They both have potential for modification. 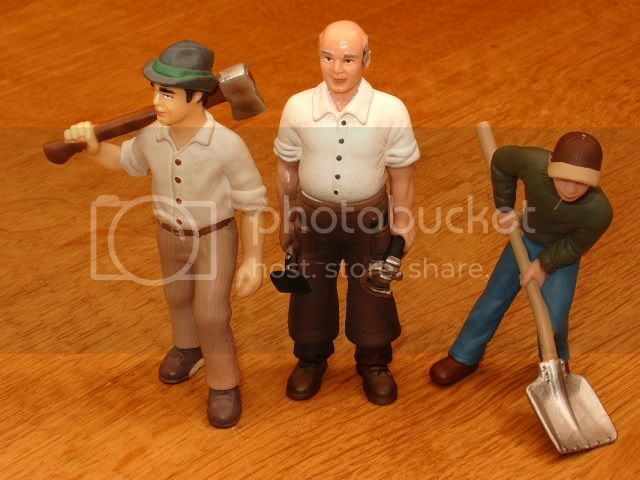 The third figure, man holding the large shovel, is about 80mm tall or just over 6' in 13mm. He would make a good seated figure - his left leg is already bent to about the right angle, so he just needs some major surgery on the right leg and the shovel removing. His left hand would require something respectable to do though. Thanks Bill, now I recognise her, converts well to a seated figure. I have another of her brothers (same as Willy) sat here awaiting the knife to go in a Gnine tender loco, when I can find the time (and inspiration ). The Schleich figures are supposed to be 1:20 scale, or 15mm to the foot and do scale out pretty well, judging from the ones I have measured. 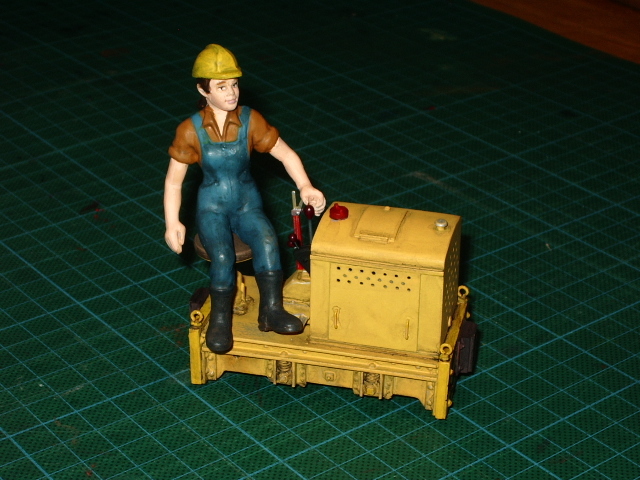 A little on the large side to mix with 1:24, but ideal in Gnine as 9mm gauge is pretty close to 7¼" in 1:20 scale . I'm impressed with the quality of them and the price is pretty good aswell .